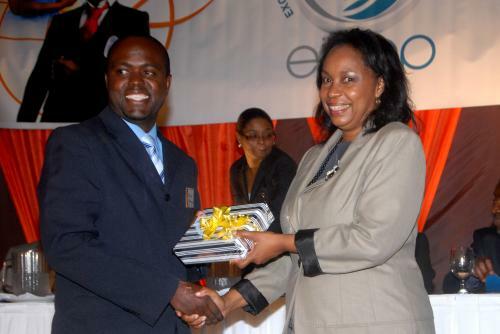 Marvin Williams is the top ITC instructor in the Excellence and Innovation in Training Awards Programme (EITAP) competition for 2012. 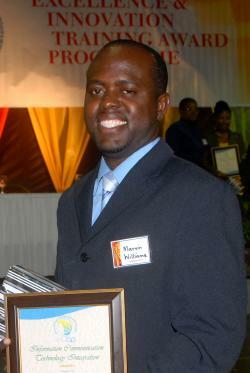 The competition, instituted by the HEART Trust/NTA saw Williams inching his way to the top from approximately 100 entrants from five regions islandwide. The instructor of Related Subjects at the Portmore HEART Academy in St. Catherine wowed judges with his innovative and creative use of technology in all subject areas he teaches- Communication, Calculation, Information Technology (IT) and Entrepreneurship. According to Williams, “incorporating ITC in the classroom is the only way forward as learners are now more exposed to technology and increasingly gravitating towards ITC infused learning methods”. As such, Williams introduced his students to password protected blogs in each subject area; creative blogs that allows students to express themselves through literature; extensive excel worksheets, timed online tests and downloadable worksheets. “Everything I created had a self-directed learning component. Therefore, my students have no excuses for being far behind even when they miss a class. They can always stay current with the lessons”, says Williams. He however admits that he didn’t reinvent the wheel for every IT programme used. “If it’s on the internet and available for download, I will use it. I will tweak a programme to ensure it is suitable for my students and their learning patterns; once a student has a problem, I go back to the drawing board in upgrading or changing the programme entirely”. The infusion of ITC in his lessons has borne much fruit as students are now more inclined to learn and are producing better results. “Each learning method has its place”, says Williams, “I combine several teaching styles and use a balanced dose of technology to bring them to life, thus preparing my students for the world of work, whether it’s as employees or as entrepreneurs”. Williams, a huge supporter of the EITAP initiative has also lent his skills to fellow instructors, hosting workshops to teach them the intricacies of creating and maintaining blogs. “I tell my co-workers that I believe the weakest student presents the strongest opportunity for a teacher to improve his/her skill”, he says. For his creativity and innovation, Williams walked away with a scholarship tenable at any institution of his choice, a Titan Tablet, Dongle and the HEART Trust/NTA recognition for excellence. Kedeisha Ellis, Instructor of Business Administration at Beechamville Vocational Training Centre placed second while Front Office Instructor of Kenilworth Academy, Ann Russell copped the third place award. The Excellence & Innovation Teaching Award Programme (EITAP) is a rebranding and repositioning of the former Instructor Quality Service Programme (IQSP), an annual motivational, instructional staff development activity. The EITAP focuses on excellence, creativity and innovation in TVET and rewards innovative facilitation practices that incorporate the integration of instructional technology leading to enhanced learning. In endorsing the programme, Mr Dermon Spence said the “National Programmes Division is totally committed to the training mandate of the Organisation and our Nation, to meet the needs of the workforce and improve the quality of life of our people”. He said “EITAP will bring to the fore, the wealth of talents and skills inherent in our lecturers and instructors and impress on them the need to continuously infuse, foster and maintain an environment of creativity and innovation. This will ensure that the trainees leaving our colleges/institutes are fully prepared to operate and offer services at world class standards”. According to Odette Brown, Organising Committee Chair, the HEART Trust/NTA recognised the need for instructors to use ITC in the classroom to not only make lessons interesting and relevant but also demonstrate fun ways to improve their skills. As such, the competition was launched to encourage the constant use of ITC as well as provide the impetus for creativity and innovation. “While we are pushing the use of technology in the classroom, we don’t want teachers to simply use the tried and trusted methods such as PowerPoint Presentations. We want them to research and develop IT systems to better aid student learning”, says Brown. Ms Brown also explained that the winners chosen this year are sub-category winners as the competition has three main categories leading to the finals. These sub-category winners can be re-entered for the year-end competition which will recognise the top instructor for creativity and innovation in HEART Trust/NTA for the fiscal year 2012/2013.